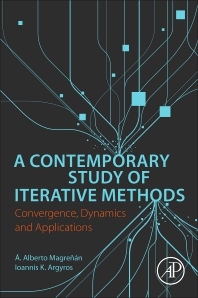 A Contemporary Study of Iterative Methods: Convergence, Dynamics and Applications evaluates and compares advances in iterative techniques, also discussing their numerous applications in applied mathematics, engineering, mathematical economics, mathematical biology and other applied sciences. It uses the popular iteration technique in generating the approximate solutions of complex nonlinear equations that is suitable for aiding in the solution of advanced problems in engineering, mathematical economics, mathematical biology and other applied sciences. Iteration methods are also applied for solving optimization problems. In such cases, the iteration sequences converge to an optimal solution of the problem at hand. Professor Alberto Magreñán (Department of Mathematics, Universidad Internacional de La Rioja, Spain). Magreñán has published 43 documents. He works in operator theory, computational mathematics, Iterative methods, dynamical study and computation. Professor Ioannis Argyros (Department of Mathematical Sciences Cameron University, Lawton, OK, USA) has published 329 indexed documents and 25 books. Argyros is interested in theories of inequalities, operators, computational mathematics and iterative methods, and banach spaces.